Tuesday night after the debate the results from the latest wave of YouGov surveys began trickling out and hit in full force today. Instead of lumping that data in with the other data from Wednesday, FHQ opted to do what it did with the YouGov data from their September wave: Deal with it separately. That is something that we have done for no other reason than because it is more efficient to get the data into the charts that way. It has nothing to do with singling out the internet-based pollster because of their methodology. In all there were 25 new polls from 25 states; down from the 27 surveys from last month. 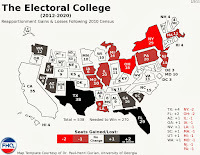 New Hampshire and New Mexico were not included this time around most likely because the already small sample sizes from September fell victim to panel attrition in October. Again, as was the case in the September write up of the original YouGov wave, FHQ will spare you a state-by-state rundown. We'll provide you with some overall impressions. All of the interviews were done in a window that fell just after the first debate in Denver, so the expectation is that we should see some narrowing in the race. And while that is true in some cases in the poll-over-poll comparisons, it is not a trend that affected each state equally or at all. Looking at the toss up states and Michigan, Nevada, Pennsylvania and Wisconsin -- ten states in all -- none were static as compared to last month. However, only half of those ten states saw a greater than one point shift since September. 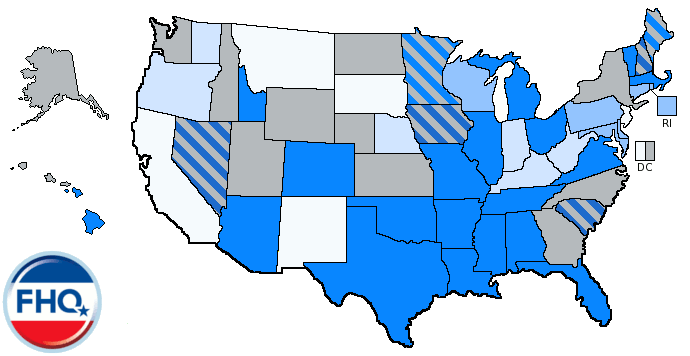 The margins in Colorado, Nevada, Pennsylvania and Virginia all contracted in a way that was favorable to Mitt Romney. The remainder, Wisconsin, actually moved more than a point -- three, in fact -- toward the president. Regardless, that sort of shift -- in the one to four point range -- is usually not a recipe for significant change in the FHQ weighted averages. 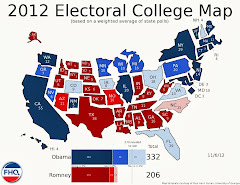 And none of the data from the 25 states represented did anything to alter the map or the underlying electoral vote tally. 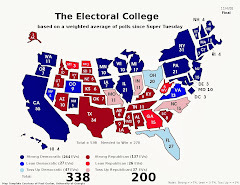 There were a couple of changes to the Electoral College Spectrum, but those only occurred in states that were outside of the two candidates' toss up categories. Tennessee and Missouri switched places in the Lean Romney area and the average in Indiana after the addition of this poll bumped the Hoosier state past South Dakota, deeper into the Romney column. The Watch List, too, was mostly unchanged. It welcomed Georgia back into the fold, but that is not all that consequential. States -- especially those on the Romney side of the partisan line -- that are hovering around the Strong/Lean line are just too far out for either candidate to reasonable sway in the remaining time before the election. So, Georgia is back on the Watch List, but there are other states below that are more worthy of a regular glance than the Peach state. Namely, Florida, Nevada, New Hampshire, Ohio and Wisconsin.